And members of Congress were quick to react. All told, the Senate gained 19 NO votes yesterday, including seven who were previously co-sponsors of the bill, according to Ars Technica. The House followed the same pattern. A few members even blacked out their own websites in solidarity with the protests. 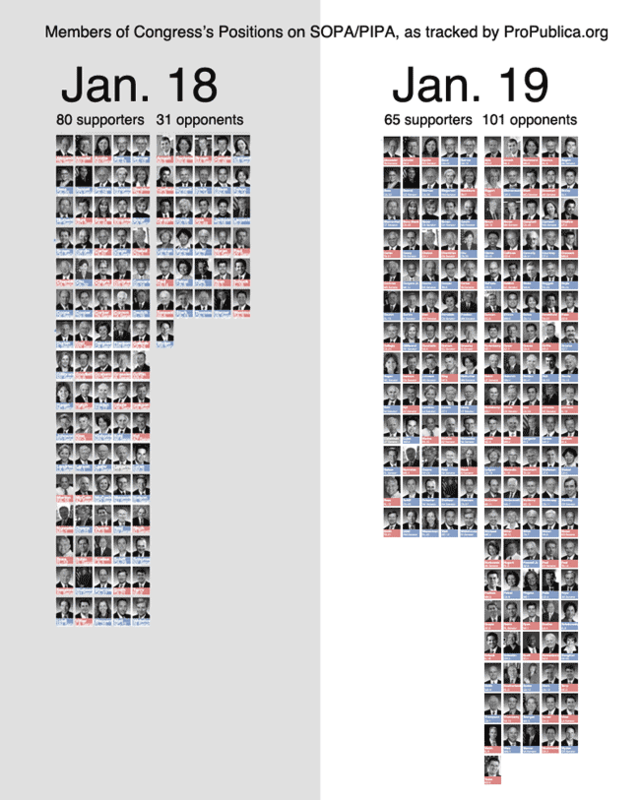 After 24 hours of online darkness, the House now has at least 87 opponents of SOPA, and only 27 on-the-record supporters. Harry Reid has already indicated the Senate will release a manager’s amendment to PIPA, but the public has made its views clear: PIPA and SOPA endanger free speech and threaten online innovation; they must be stopped completely. We must continue to send that message until Congress drops the blacklist legislation permanently. Please take action and tell your representative in Congress to oppose this bill. You can also invite your friends on Facebook to participate in a call-in day on January 23rd. The vote is less than a week away — your voice is needed now more than ever.